Up for an early morning walk along the Rio San Gabriel riverbed this morning. It was crisp and clear, a beautiful beginning for the day. How beautiful! That looks like a Rails-to-Trails path. It does look like a rails-to-trails. I didn't really notice it before. 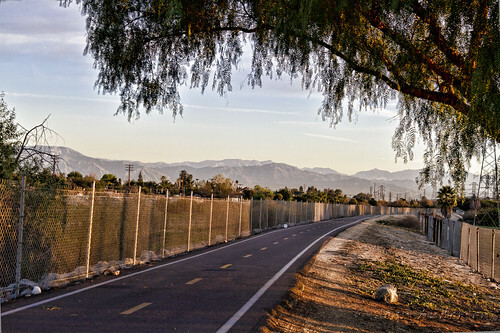 It isn't, it is just a bike/walk path that follows the Rio San Gabriel riverbed. I believe it actually runs about 50 miles starting in the San Gabriel mountains and ending in Seal Beach.